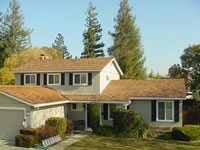 Los Gatos Roofing is a leader in Residential Roof Replacement. What this means to you as a consumer is that you are working with a strong local company with a solid long term history of installing new high quality roofs at a fair price. Some of our customers have had us replace their roofs several times due to moving, rental properties or severe storm damage. Read some of our testimonials from our customers and you’ll see why Los Gatos Roofing is a trusted Roofing Contractor. If your roof is in need of repair or replacement, call us for a Free Estimate. There’s no obligation and you will then have professional advice on your roof system. Call us at 408.298.9399 today. As you begin your research for a roofing contractor, there are several important factors to keep in mind. We want you to be properly prepared and educated before you start. We know that the more you know, the more likely you are to choose Los Gatos Roofing for your roofing project. 1. General Liability Insurance Certificate – Not “Self-Insured”: You need to know if your contractor carries general liability insurance. A sizable contractor will carry no less than $1,000,000 per occurrence….and usually around $2,000,000 of aggregate coverage. Over three-fourths of roofing companies do not carry proper insurance coverage to protect you against losses. 2. Release of Lien: All contractors should provide a Lien Release prior to final payment. All material suppliers and sub contractors should provide lien releases as well. 3. California Legal Contracts: All Home Improvement Contracts should contain start and completion dates, Notice to Owners, Mechanics Lien Law rights, 3 day right of rescission, in addition to the specific job description. 4. Current References: All reputable roofers should provide pre-printed lists of references and installations of all roofing products installed by them. Also, ask for suppliers, business references, etc. 5. There Are No Circumstances Where You Should Give Cash Up Front: California law dictates a maximum of a 10% deposit up to $1,000. Reputable roofing contractors will not need cash up front. Be careful of contractors who ask for money up front, especially if your roof is standard wood, composition, or tile shingles. This is the number one area of fraud among contractors. Also be aware of contractors demanding money upon material delivery, which is a sign of bad or no credit with a supplier. This is a strong indication of a struggling business. 6. Trade Association Certificates of Standing: Belonging to trade associations implies some quality and ethical integrity on the part of the contractor. Associations like the National Roofing Contractor Association and the Better Business Bureau are common associations. 7. Use Only Manufacturer Certified Companies to Install Your Roof: Los Gatos Roofing is certified by all major manufacturers of residential roofing products. 8. Quality Control and Jobsite Management: Your Project manager will work with you from estimating all the way through to final inspection. This will provided a clear communication channel throughout your project and ensure you are delivered what you are promised and get the best roof possible. 9. Strong Internet Presence: All companies should have consumer reviews posted on internet sites such as Yelp and Angie’s List. These reviews provide an honest reflection of a company’s performance. We hope this list will give you the knowledge you need to find the best contractor for your roofing project. Just remember, if it sound too good to be true, it probably is. You will always get what you pay for! Contact us today to discover more about what sets Los Gatos Roofing apart.